The Trump administration on Tuesday announced new sanctions on Iran and Russia for engaging in a financial scheme to enrich the embattled Syrian government led by President Bashar al-Assad, according to U.S. officials. The Trump administration's Treasury Department is cracking down on an oil shipping scheme led by Iran and Russia that has been providing "millions of barrels of oil" to the Syrian government as it continues its assault in a bloody civil war that has dragged on with no end in sight. "The Assad regime, in turn, facilitates the movement of hundreds of millions of U.S. dollars to the Islamic Revolutionary Guard Corps-Qods Force (IRGC-QF) for onward transfer to Hamas and Hezbollah," both of which have been propped up and armed by the Iranian regime since the landmark nuclear deal was put into force. The new actions come as the Trump administration undertakes an effort to crack down on Iran's malign activity across the region, including in Syria and Yemen, where Iranian militants have wreaked havoc on civilian populations. Tuesday's sanctions follow the reinstatement of economic penalties lifted by the Obama administration as part of the nuclear deal and in tandem with upcoming actions to declare Iran in breach of chemical weapons bans, as the Washington Free Beacon first reported on Friday. "Today we are acting against a complex scheme Iran and Russia have used to bolster the Assad regime and generate funds for Iranian malign activity," Treasury Secretary Steven Mnuchin said in a statement announcing the new sanctions. "Central Bank of Iran officials continue to exploit the international financial system, and in this case even used a company whose name suggests a trade in humanitarian goods as a tool to facilitate financial transfers supporting this oil scheme." "We are issuing an Advisory today identifying the grave risks to the maritime community if they participate in shipping oil to the Government of Syria," Mnuchin said. 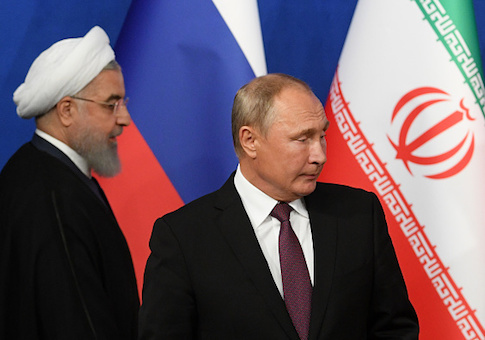 "The United States is committed to imposing a financial toll on Iran, Russia, and others for their efforts to solidify Assad's authoritarian rule, as well as disrupt the Iranian regime's funding of terrorist organizations." Those sanctioned under the new measures include Syrian nationals and the owners of a Russian-based company believed by the United States to be smuggling oil from Iran to Syria and paying off Tehran's Iranian Revolutionary Guards Corps, or IRGC. 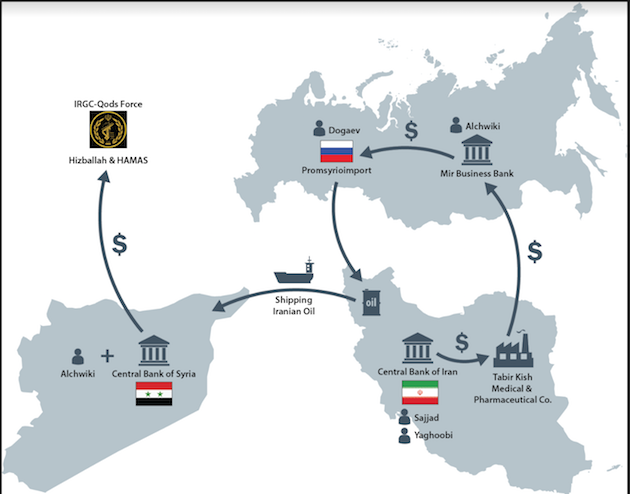 Mohammad Amer Alchwiki, a Syrian national who works on behalf of Russia's Global Vision Group, is said to be central to "the delivery of oil from Iran to Syria, and the transfer of funds to the IRGC-QF's lethal proxies," according to the Treasury Department. Global Vision Group works alongside Russian state-owned Promsyrioimport, a subsidiary of the country's Ministry of Energy. The latest effort is part of the Trump administration's efforts to crackdown on Iran's support for terrorism and involvement in regional conflicts, according to U.S. officials. Iran has undertaken this activity as its economy teeters on the brink of collapse, causing mass civilian uprisings inside Iran. "Throughout the Syrian Civil War, the Iranian regime has continued to provide military and financial support to the Assad regime, enabling it to commit mass atrocities against the Syrian people," the Treasury Department said. "The Iranian regime also continues to fund terrorism, providing hundreds of millions of dollars to its regional proxies and U.S.-designated terrorist organizations, Hamas, and Lebanese Hezbollah, further destabilizing the region," it added. "All the while, Iranian citizens suffer from their government's neglect and corruption, including through a lack of stable food and water supplies, electricity, and other essential needs." "The Iranian regime continues to prioritize spending money on fomenting terror over supporting its own people," Mandelker said. "This is yet another example of the regime using the proceeds of millions of barrels of its oil to fund terrorists and the murderous Assad regime to the detriment of its own people. The United States will aggressively seek to impose sanctions against any party involved in shipping oil to Syria, or seeking to evade our sanctions on Iranian oil. Shipping companies, insurers, vessel owners, managers, and operators should all be aware of the grave consequences of engaging in sanctionable conduct involving Iranian oil shipments." This entry was posted in National Security and tagged Iran, Russia, Sanctions, Syria. Bookmark the permalink.